Quick Response Manufacturing (QRM): The faster your production chain, the better! To that end, you should transform your shop floor and even your entire supply chain. Create loosely connected Quick Response Cells, each handling groups of similar tasks. This will make it much easier to produce-to-order, with short delivery times. As a result you will not only become more attractive for customers, it will also save you money because of a reduced overhead in the form of unnecessary handling and stock keeping. These are only examples; many other sources of system-wide waste may disappear. What kind of companies are successfully applying QRM? We figured it out when we visited the 11th international QRM-conference last year! Unfortunately, efficient production does not go hand-in-hand with flexible production naturally. Of course, when you make a limited number of items and the demand is relatively stable for a long period, then it is possible to design perfectly balanced production lines. You can compare this by digging channels through which specific groups of vessels (read products) will sail. In practice however, customers ask for an increasing number of different products, often customized to their wishes. In addition, the pace of new market introductions is increasing. On top of this comes the effect of these economically turbulent times, with rapidly changing demand and customers that order more often, but in smaller quantities. The result of these facts is that companies are forced to “dig” an increasing number of dedicated production channels. The only alternative seems to have a lot of intermediate stock (anchored ships). Both options are far from efficient! Logistic improvement methods such as lean manufacturing and the Theory of Constraints (TOC) are constantly evolving. As a result, many different solutions were developed to make production not only more efficient, but also more flexible. However, there is also a logistic improvement method that focuses specifically on creating flexibility to produce customized products. 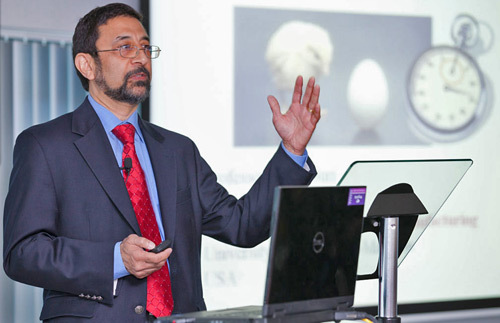 This is Quick Response Manufacturing (QRM), developed by the American professor Rajan Suri. The tools of QRM partly overlap with those of Lean and the TOC. Most characteristic of QRM is the principle that all improvement initiatives should reduce the Manufacturing Critical-path Time or MCT. This MCT is defined as the time from when a customer creates an order, until the first part of that order is delivered. Note however, that there is an important boundary condition: the order should travel the critical path through the supply chain, from raw materials to the delivery. The shorter your MCT, the greater is your ability to deliver customized products quickly. To shorten the MCT, sometimes things have to be done that seem inefficient locally. For example producing in small batches with frequent changeovers. In addition, some capacity of your machines should be left unused to prevent waiting times. Overall, these measures will have a positive effect because a short MCT means among others less work in progress, less mistakes, and fewer calls by customers to complain about late deliveries. In addition, short waiting times make it possible to respond accurately to the demand, so you will create no stock of possibly unsalable products. Finally, it gives you a competitive advantage when you can deliver faster than others. The most important way to reduce the MCT is the formation of multidisciplinary production and office teams. These so-called Quick Response Cells or QRC's deal with work for Focused Target Market Segments. On the shop floor in general a series of QRC’s, each suited to perform a certain class of operations, is needed to complete a product. Depending on what is to be produced, an order visits a variable number of QRC’s. There are no a priori fixed routings. This makes customized production possible, almost without intermediate stock! To prevent traffic jams on the shop floor, the Kanban-variant POLCA can be used to spread the workload over the QRC’s. POLCA implies that all production cells which can exchange materials, are in pairs connected by circulating POLCA-cards. A POLCA card S/R, with on one side the supplying workcell S, and on the other side the receiving work workcell R, gives production cell S permission to produce semi-finished products which need further processing at cell R.
When the work is ready at cell S, the product is sent to cell R, together with the S/R card. Next, when work is finished at R, the POLCA card is returned to workcell S. This is the signal for this workcell that free capacity has become available at R, so it’s again permitted to produce products that need processing at workcell R later (which will start a new POLCA-cycle). Quick Response Manufacturing (QRM) suggests a completely different solution to enable flexible production: a switch to cellular manufacturing with Quick Response Cells (QRC's). Then, the routing for each item (or ship) does not need to be fixed in advance anymore. Instead, products are made by sending them along a freely selected number of QRC's. Note, that QRM supporters consider the creation of Quick Response Cells only as a means. Their true objective is to shorten waiting times everywhere, thus within all departments and in the entire supply chain. More precisely formulated, QRM focuses on reducing the Manufacturing Critical-path Time. This is the lead time from getting the raw materials, to the delivery of the finished product to the customer. So, the holy grail of QRM is a faster supply chain! The rationale behind this is the possibility of time-based competition. A QRM-company can attract customers that want their products as fast as possible. In addition a faster supply chain will also reduce your overhead costs. For example, less material handling is needed, because there is much less stock in your production pipeline. Besides that, many other sources of system-wide waste may dissappear. The QRM-movement, headed by Rajan Suri, originated about 15 years ago in the US. In recent years, QRM also became popular in the EU. In 2010 the University of applied sciences of Arnhem and Nijmegen (HAN) set up the first QRM Center outside the USA in the Netherlands. Knowing this, it is no wonder that also the first international QRM conference outside America took place in Holland. This conference was held from 5 until 7 June 2012. Approximately 120 participants attended a variety of lectures in the WCT building in the city of Arnhem. One of the speakers from the US was Mike Ketter, corporate continuous improvement manager at Harley-Davidson. "Before we started to apply QRM, we used to make as many motorcycles as possible", says Ketter. "Next, those machines were shipped to the dealers, in the hope that they were sold. However, today customers only want exactly what they have in mind, and as soon as possible. When we realized this we decided to adapt our production process, to respond more quickly and flexibly to the market demand. To achieve this, we needed the cooperation of our suppliers. 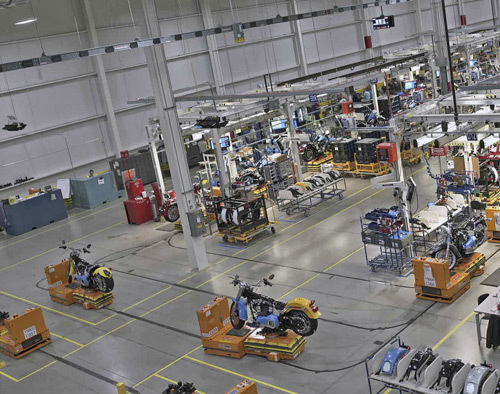 Without timely delivery of equipment, such as lighting and seats, you cannot build motorcycles just-in-time, tailored to the specific needs of your customers." 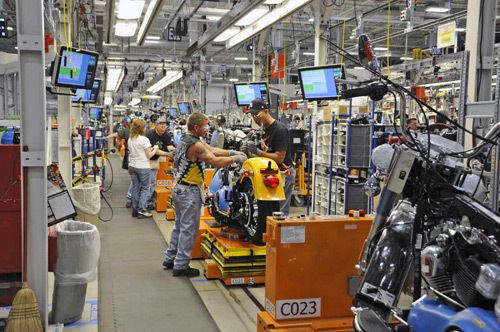 To clarify their needs to the suppliers, Harley-Davidson wanted to make flexibility measurable. They defined it as the ability to respond cost-effectively to demand changes, without compromising the quality or the delivery performance. Next, two key performance indicators (KPI’s) for flexibility were developed. First, the aforementioned Manufacturing Critical Path Time or MCT. The definition for the MCT, which was adopted by the whole QRM community later, was developed by Harley-Davidson together with John Deere, Oshkosh Truck Corporation and the University of Wisconsin-Madison. It gives you an indication of how good you are at making many product variants. "The second performance indicator we use is the Response Capacity”, Ketter continues. “This KPI shows how well you can handle demand fluctuations. Let me give an example. In the summer we sell much more motorcycles than in the winter. If a supplier has a high Response Capacity then our ordering pattern can closely follow this yearly demand cycle. In 2010 and 2011, 70% of our suppliers followed a workshop sponsored by us. After that 90% of the participants calculated their MCT and Response Capacity, and shared these numbers with us. Now we help them to improve their weakest points." RenewAire in Wisconsin embraced the QRM philosophy already nine years ago. "As a result, our waiting times have become so short, that the external supply chain has become the limiting factor", says president Chuck Gates. "Therefore we would like that also our suppliers reduce their MCT. Being a relatively small company, our purchasing power is not big. Therefore, we try to convince our suppliers of the benefits of QRM, by organizing training sessions and by giving them books." Before they started to apply QRM, RenewAire was only a small player on the market for ventilation systems. "At the time, we asked ourselves how we could compete with much larger companies with big R & D capacity. That seemed an up-hill battle, and besides that we had planning problems. When we were making customer specific products, we looked like a group of contractors running around a house, with lots of oh's and ah's when we found the place where the bathroom should come this time”. Predicting the demand turned out to be impossible. “Instead, when a customer complained about late delivery we threw everything aside to speed up their order. However, as a result other orders were delayed. That way we created a downward spiral with an increasing number of complaints, an increasing number of rush orders, and an increasing delay of the other work”. Focusing on reducing the waiting times brought the solution. "This QRM principle aligned our goal with that of our customers. In addition, it helped to bind the people in our company to each other. All departments now work in unison." Some overcapacity was deliberately created. “As a result, queues of orders cannot occur. We spend idle time on process improvement. We always have a pipeline filled with ideas "
A remaining problem is that not everyone can see the direct relationship between their work and the MCT. "However, they do understand that they should focus on short lead times." After applying QRM for nine years, the throughput time was reduced by 56 to 80%, depending on the type of product. The profits largely exceeded the investments. “Now we have only an amount for one day of work in progress, and our overhead and labor costs are only 9% and 7% of our turnover respectively. In addition, our sales continue to grow." In the case of RenewAire, production means mainly assembly. This explains that one QRC can complete an order. In most other QRM companies several QRC’s must be visited to complete a product. To distribute the work over the QRC’s the POLCA-system can then be used. This is a Kanban variant for custom-specific production. In makes people in QRC’s only work on products for subsequent cells, when those cells have signaled with POLCA-cards that they have free capacity to process the products further. That way, congestion in the network - and therefore waiting - is avoided! Bosch Hinges applies POLCA to spread the workload over their workcells. POLCA enables production in small series without stock. 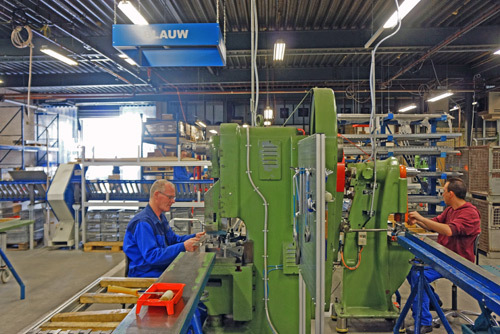 Bosch Scharnieren (Hinges) in the city of Doetinchem, a metal processing company that makes hinges, was five years ago the first Dutch enterprise which had the courage to implement the POLCA-system. They completely rearranged their shopfloor to create eight QRC’s for tasks such as work preparation, folding and rolling. 'That was a big step”, says CEO Godfried Kaanen. “It meant that we stopped striving for a One Piece Flow, in which case different product variants follow the same production route. We make too many different products to make that possible." The introduction of the POLCA-system was a great success. "However, after the first wave of the economic recession, our order mix changed. Customers are now ordering more often, but in smaller quantities. As a result we have to handle more than 5,000 orders each year, that have to pass four QRC's on average. After each passage, a POLCA-card must be returned to the supplying QRC. This happens about 20,000 times a year, and this takes unnecessary time if you do that manually. As a countermeasure we developed a digital POLCA system, we named PROPOS. We think this solution is also suitable for other companies. Therefore, together with the software developer, we are going to market it." On the shop floor of Bosch Scharnieren there are now 17 computer screens. "The information you see on those screens is comparable to the departure information of airplanes. In each QRC, the people can see on which orders they are allowed to work and what the priority is. An order that is standing ready in front of a QRC, but which is not freed for processing yet, is also visible. This makes the current situation clear to the operators. If they want, they can open a new window with the POLCA-cards on it. In this case they would see that a POLCA card is missing for the order concerned, so there is no free capacity downstream yet to process it further. That is the reason why they aren’t allowed to start working on it. This example clearly shows that process improvement tools work best when you customize them for your own situation. In a similar way, the Belgian company Harol Consyst, a manufacturer of awnings and roll-down shutters, reforged the POLCA-system into their perfect planning system. "In 2010 we started to apply POLCA for the production of awnings", says operations manager Arthur Vandebosch. "However, for releasing orders to our shop floor we use a different system, CONWIP. This stands for CONstant Work In Progress. We move semi-finished products on carts. Only when an empty cart comes back, a new order is released. This keeps the amount of orders on our shop floor constant. This way, our packaging department determines our production rhythm, instead of the first work cell." After their release orders take different routes, to visit the QRC’s they need to complete production. Some awnings use frames which are already painted in a standard color. In other cases, it is needed to paint a frame in a special color, as wished by the customer. “In all cases the POLCA-system ensures that the workload is spread evenly over our QRC’s, so that traffic jams are prevented”. Harol calls this combination, with CONWIP for order release and POLCA for workload control, POLWIP. The productivity didn’t increase yet, but Vandebosch is convinced that it is possible to raise it. "The most crucial step in producing the awnings is the merger of the clothes and the painted frame. These two parts should arrive simultaneously at an assembly station. The bottleneck proved to be our paint hall. Frames painted in special colors are not always ready in time. We will solve this with a new paint hall which has a larger capacity. This will also make it possible to stop with the production of pre-painted frames in standard colors. Today, 75% of our consumers already want their frame in a design color. When we stop with frames in standard colors, the warehouse needed to store those frames can also disappear. This frees space, which can then be used to improve our production layout. 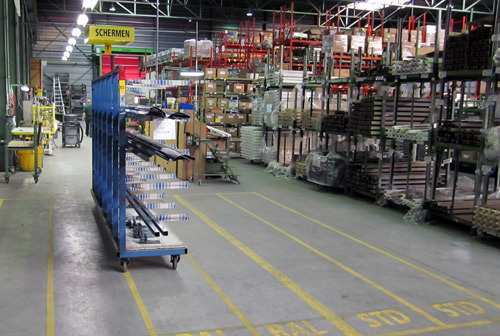 Semi-finished products should move more or less in a straight line through our factory. " Last year, Harol started to use the POLCA-system also for the production of the roll-down shutters. "Releasing the orders with CONWIP, as we do with the awnings, in this case was not enough. Depending on the type of slats to be used in a shutter, in the middle of the production route a shutter has to pass one of four types of QRC's, called Acra's. When you release for example a lot of orders which need processing at for example ‘Acra1’, this gives problems." The combination of a Matrix system for releasing the orders and POLCA is called POLTRIX. "Pascal Pollet of Sirris has developed this system, together with Kristof Souwens of our company. Sirris is a technological knowledge center, subsidized by the Belgian government, with 2,500 companies as members." "In a Quick Response Cell work is done completely different than before. Therefore change management is very important”, says Bob Mueller. He is plant manager at P&H Mining, part of JoyGlobal. The latter is a manufacturer of machinery for mining, with nearly 12,000 employees worldwide. Since 2003, P&H Mining invested millions of dollars in the transformation from a functional to a cellular organization. Families of production operations are now done in Quick Response Cells (QRC’s). Recently, new QRC’s for the production of ‘small round parts’ were created. This meant that the machines were positioned much closer together, and that the team that works in the cell became bigger. As a result, people were not allowed anymore to have their own tools, and their armchairs had to be replaced by simple seats which take less space. Even though the work can be done more efficiently, this does not mean that such a change is immediately accepted. "Compare it with the history of the mining industry", continues Mueller. "P&H Mining was founded in 1880. At the time, people working in the Phelps Dodge Morenci Mine still used donkeys to transport the ore."
Those days, mining meant heavy work. The workers were however proud, because not everyone could cope with that. "Today, in the same mine, mining is done with our machines, in which the operators sit in air-conditioned cabins. This change, although the advantages seems obvious, was not carried through without problems." Mueller continues with a description of his recipe for change management. This turns out to be very top-down: to a target audience it should be explained why a pre-arranged change is needed! When I hear this, I ask Mueller why his employees could not help to design their own QRC. "In this case that was not possible, because we did not know who would work in the new QRC’s”, replies Mueller. Although his approach seems quite directive, Mueller also gives some great tips. For example, it is useful to think in advance not only about the technical aspects, but also about the impact the new way of working will have on your people and their expectations. “Organizational goals such as a higher productivity, bringing back outsourced work to the factory and streamlining activities could be translated into things that appealed to our workers: a higher salary, increased job security, and learning new skills. If you can make such a translation, you remove a lot of resistance to change." The workers also understood the advantages of the new way of working faster, and more people became convinced themselves that it would work. Do you need help with the implementation of QRM and/or POLCA?